If you are a fan of the TV series I would urge you to read them. They still have all the things that I loved about the show namely awesome characters with witty dialogue and a brilliant story line. The main differences being that because anything can go because the writers and artists are not restricted by a TV budget and my word anything does go. There are so many crazy things that kick off and guest appearances from much loved characters from the shows that I was in Buffy-Geek heaven. 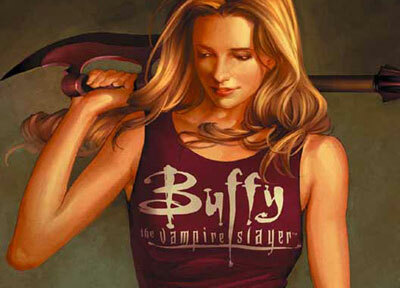 I'm reading pretty much anything Buffy I can get my hands on right now too! Just got done with the show a few weeks ago and had to get my hands the comics. I'm in the third bond book Wolves at the Gate and have finished the first Buffy Omnibus. Like you mentioned, I'm enjoying it because it really is anything goes in the comic. I must say though, Season 8's premise would be awesome for a t.v. show: Buffy training a bunch of Slayers with bases all over the world. Love it! I am going to have to invest in the first season of Buffy. I feel terrible that I haven't ever seen any of them.